A new spark of energy for a new passion. Emotions are rising up for new love. 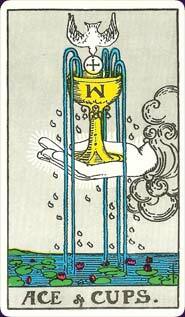 The Ace of Cups usually indicates that the querent is feeling a new welling of emotion or beginning to have some vivid dreams. They're not writing the poetry yet, but they feel the desire to, or they may have caught sight of a figure across a room and felt a tug at their heart, or even passed by some holy place and felt their spirit yearning. They've lifted the cup and they want to drink from it. Learn the Ace of Cups tarot card meaning and the rest of the card meanings, symbols and stories in our eBook.